My favorite thing about my pond is sitting on my deck overlooking it while enjoying my afternoon tea. Every day in the afternoon, I make a pot of tea that gives me several cups. I vary the type of tea I make. I love green tea, but I love black tea and oolong tea just as much. White tea is perhaps my favorite of all. Then there is jasmine tea, which is the most relaxing. Any one of these is great. One of my favorite things in the world is to sip on my hot cup of tea while looking at my pond. There are so many different types of ponds, which are suited for this type of activity. For relaxing. For having some tea and looking at it. For just enjoying the nature of it. The truth is almost every pond works for this, but some are better than others. 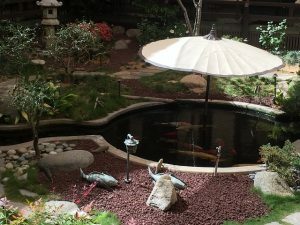 Let’s begin with the ever popular Koi pond. This is a pond, it can be many different styles and types, that has Koi fish in it. Koi are really just like large goldfish. They come from Asia, but are popular all over the world. One of my favorite features to add to a pond is a waterfall. You need a little pump that pumps water up the hill and then have the water fall down over some rocks. I love the sound of this and it is so soothing. It is not just soothing during tea time, but also at night when you want to go to sleep. 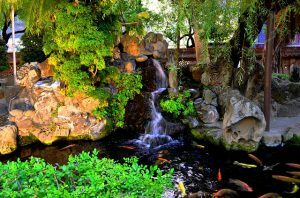 If it all possible, you definitely want to add a little waterfall to your pond. One thing to be aware of is that ponds often attract frogs and they can be quite loud. While the waterfall at night is very comforting and easy to fall asleep to, the frogs are the exact opposite. It can be difficult to fall asleep with a bunch of frogs croaking all night long, so beware of this when installing your pond. This pond looks too artificial for me. As mentioned, you can use any type of pond for this. The best generally have a lot of plants in them and they look natural. I don’t like artificial ponds. Of course all these ponds are artificial, but you want to make them look as natural as possible. Another type of pond of mentioned a few times on this site is an indoor pond. These are not as popular, but in many climates they are great. They are also good if you have space indoors but you don’t outdoors. For these you would want artificial grow lights, with LED grow lights being the best and most efficient. These horticultural lights will help your plants grow even indoors when there is no sun. Adding some grow lights outdoors is not a bad idea either, if you are trying to grow plants that need more light than is available in your climate. Most ponds do fine without grow lights, but they certainly don’t hurt and they always help. As for the size of your pond, it shouldn’t be too big. You don’t want to overwhelm your garden area and you definitely don’t want to create too much work for yourself. But you don’t want a tiny little pond either, especially if you have fish in there. 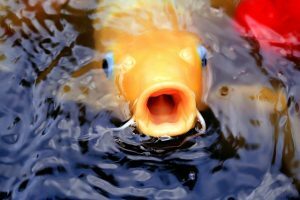 Koi grow to be quite big, so if you’re doing a koi pond, it does have to have enough size that the fish could comfortably live. And they need enough plants for them to feed on as well. 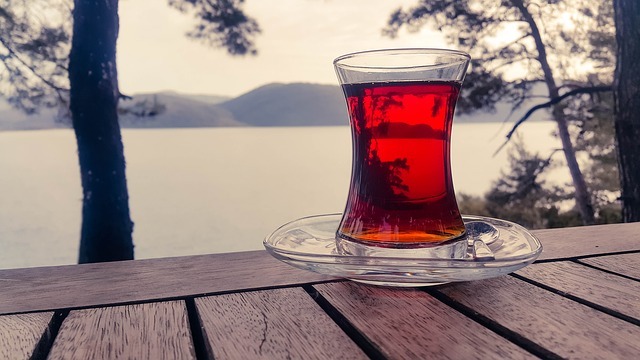 If you enjoy having a cup of tea (or two or three) as much as I do, then I’m sure you will also enjoy looking at beautiful scenery while drinking your tea. If you live in an area that already has a great view, you are lucky. But if you don’t, you can enhance your view very quickly and easily by installing a pond. Ponds are wonderful additions to any garden.